In other words, said architect Andrew Frontini, principal at Perkins+Will, visitors are free to use the facilities based on their gender identity. The new Albion Library, opened earlier this summer, is the first of Toronto’s 102 branches to introduce gender-neutral washrooms. And this is just one of the ways the accessible, one-storey facility promotes inclusivity by design in the diverse community it serves. Located in Etobicoke, in one of the city’s priority neighbourhoods, the facility provides a venue for employment and skills programming as well as an opportunity for visitors to use technology they may not have at home, from computers to 3D printers. There are books too, of course, including collections in languages such as Chinese and Punjabi. The regional branch is so valued that, based on community input, Toronto Public Library scrapped its plan A, which was to renovate and add on to the original circa-1970s building. This approach would have closed the facility for up to two years during construction, said Susan Martin, manager of branch capital planning and implementation at Toronto Public Library. “The community basically said, ‘We would rather you not renovate our branch, because we can’t be without it for two years,’” she said. Working with Perkins+Will, Toronto Public Library developed plan B, which was to build a new facility on the under-used parking lot, allowing the existing facility to stay open for all but a final three-week stretch during the move from one to the other. Albion Library serves a multi-cultural community comprising 85-per-cent visible minorities, including many recent immigrants. Liberated from book shelves, the flexible space features modular furniture, including ottomans outfitted with built-in power outlets, which can be moved out of the way or rearranged for events. Elsewhere, many of the bookshelves rise only 52 inches, providing unimpeded views from the circulation desk through to other zones, such as the Early Literacy Centre, which is for the under-five set, and the Childhood Discovery Centre, which is for six to 12-year-olds. Martin explained that a lot of space is allocated to kids because demographic studies showed that the community had a greater-than-average proportion of youngsters compared to the rest of the city. The facility not only gives kids, and others, access to technology, but also hosts programming that teaches students skills such as coding and robotics, which, as Frontini pointed out, may open up potential career paths for them from a younger age. While the former facility had integrated new technology as it became available, its infrastructure was less than ideally suited to some of today’s service requirements, having been constructed in a pre-computer era, observed Martin. Its incompatibility with current service requirements was one of two key reasons the former facility was tagged for a major renovation. The other, more pressing reason was that it required work to maintain a good state of repair. “All of the HVAC systems were past their end of life, there was no exterior insulation because it was a concrete block building, there were structural problems with sections of the roof because of the original building design,” explained Gail Rankin, senior manager, facilities management, Toronto Public Library. The new 29,000-square-foot facility introduced features including a cooled garbage room, which Rankin said helps control odour as the facility manages high volumes of waste. One source of garbage, the washrooms, is tailor-made for ease of maintenance based on past experience. “We’ve been perfecting our washroom design over the last 10 years to make it easy to clean,” said Rankin. As examples, she cited the large-scale tiles for the floor and walls, which cut down on grout, and the floating sinks, which eliminate water build-up in counter-top corners. In addition, the new facility gave the library an upgraded building automation system and a green roof complete with solar installation. 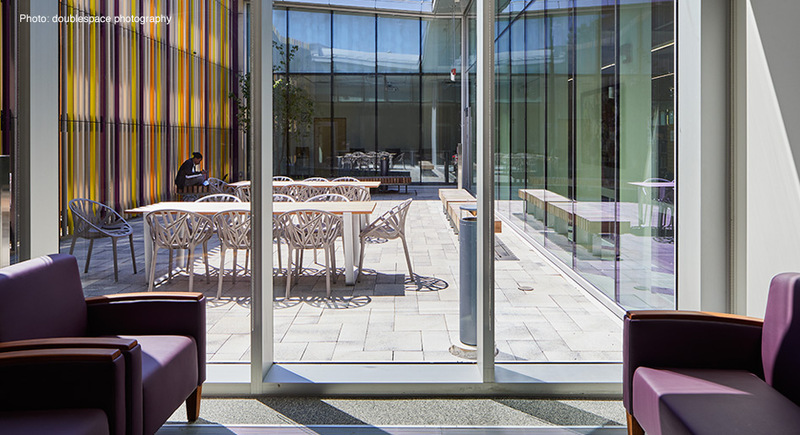 Outside, the facility is defined by a façade clad in glazing and crowned with a fringe of multi-coloured tiles. “They’re free-hanging vertical strips of the terracotta to make a screen that you can see through, kind of like a fence into the courtyards,” said Frontini. Behind the building, there are community gardens that will be programmed by local groups, who will have access to a storage facility for their tools at any time from the exterior. And the site of the former facility is now being transformed into a lushly landscaped parking lot that will double as a plaza, accommodating events such as farmers’ markets. In first couple of weeks after it opened, Albion Library avoided the dip in attendance normally seen in new facilities, which Martin attributed to the abbreviated closure. Quite the opposite, the digital counters documented a close to 50-per-cent year-over-year increase in foot traffic. At least one of Albion Library’s inclusive features is due to be rolled out to the rest of Toronto Public Library’s 101 branches as they undergo capital improvements: the trans-friendly washroom signage. So far it has been well-received, Martin reports, and there are plans to host related library programming that will be developed with input from the local LGBT community. Michelle Ervin is the editor of Canadian Facility Management & Design.